Jindal Realty Pvt. Ltd., one of the renowned real estate developers in India, today launched its massive tree plantation drive to plant 10,000 trees across Sonepat City. Various varieties of shady and ornamental trees are being planted at Sonepat Global City. The drive was launched in the presence of Mr. Gaurav Jain, MD & CEO, Jindal Realty; and Mr. Sanjay Kumar Arora, President, Rotary Club Sonepat. This campaign aroused a lot of interest in the young minds towards trees and their vital role in correcting ecological imbalance. That’s why a lot of students from OP Jindal University also participated in this Green Mission. He further informed about the plan of the company to include 1 percent of cost of project in the estimates for greening of areas along the roads. 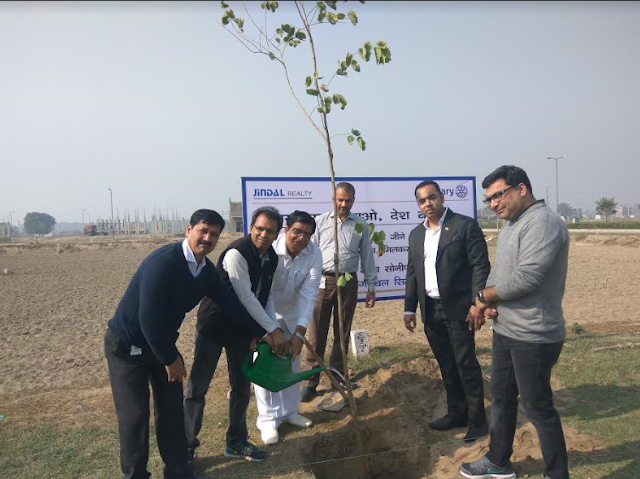 Supporting the noble cause, Mr. Sanjay Kumar Arora, President, Rotary Club Sonepat, said, "Excellent initiative of planting trees has been taken by JRPL. I would like to urge everyone in Sonepat to support and join the initiative. This drive has been launched in pursuance of the objectives to enhance the tree cover in Sonepat, which is an upcoming residential hub in NCR”. About Jindal Realty Pvt Ltd: is backed by a strong foundation of the Jindal Group Company which is an industrial powerhouse with a dominant presence in steel, power, mining and infrastructure sectors. The group was founded by Shri O.P. Jindal, a first-generation entrepreneur and steel visionary who started an indigenous single-unit steel plant in Hissar (Haryana) in 1952. It is now one of India's most dynamic business organizations. Sonepat Global City is a signature project of the renowned real estate developer, which is ready to set a benchmark in the realty industry. It is an exemplary mega township project that offers an entirely new city with urbane and refined living experience. Stationed in North of Delhi, the leisure destination sprawls across 650 acres of landscaped environs and has pleasing and well maintained landscapes that offers an amazingly developed township with state of the art infrastructure, health care, sports facility, shopping facilities and other top-notch facilities. The eco-friendly project boasts of various facilities like rain water harvesting and sewage treatment plants. Sonepat Global City will have modern round the clock security, wide walkways, theme parks, and much more; making it a dream project to live in.